What to do: Let your singing be tempered by a manly soberness and austerity, as if you were respectfully singing somebody else's national anthem. Let your lips remain thin, your body erect, and your hands at your side where everyone can see them. What to think: As a matter of fact, I'm not 100% certain of the doctrinal correctness of this verse. I'd better mumble the words just to be on the safe side. What to do: Let your depth of feeling be inversely proportional to the depth of meaning in the lyrics. Too much meaning = boring. "I'm coming back to the heart of worship" = very intense. The singing must also be done with the aid of an exceptionally talented band. What to think: I'm not thinking, I'm worshipping. What to do: You should sing all the Pentecostal songs, but sing them as if you were a Presbyterian. This means you get the best of both worlds: you can sing songs that don't mean anything while feeling nothing at the same time. What to do: Don't even bother opening the hymn book. What to think: Hymns? You can't expect Vatican II to be right about everything. What to do: Same as above. What to think: On second thought, I should probably open my hymn book. What to do: Same as above. Except that there is no hymn book. And no hymns really. What to think: Is this another hymn? I wish there were some kind of hymn book. I guess I'll just keep belting out "Kyrie eleison" every twenty seconds and hope for the best. What to do: Sing! Sing like your life depended on it! Sing till your heart cracks and your eyeballs sweat and your great grandmother taps her bony foot in the grave. What to think: Anything worth singing once is worth singing forty times over. What to think: Think whatever you like, as long as you keep it very Zen. 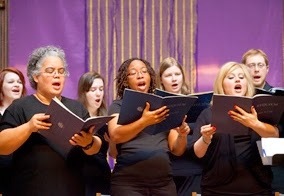 What to think: Singing is a culturally relative and outdated form of religious expression. We don't do that kind of thing around here because we wouldn't want to create unnecessary obstacles or to make anybody feel uncomfortable. What to think: Same as above. What to do: Step 1: Change the lyrics to remove all references to God. Step 2: Resume singing like a Presbyterian.